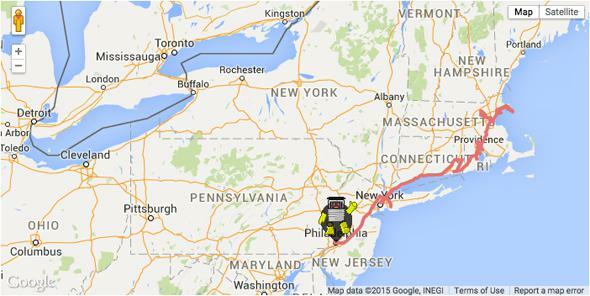 HitchBot went on a hitchhiking tour, but was destroyed while going from NYC to Philadelphia. HitchBot is a robot built for studying human interactions. It hitchhikes through different countries examining the goodwill of humans, and so far it has had successful trips around Canada, the Netherlands, and Germany. But it took only two weeks of traveling in the United States for something to go wrong. HitchBot got off to a good start on July 17, traveling around Massachusetts and New York City before heading to Philadelphia. But by Saturday, the Canadian researchers who run HitchBot had lost its signal. But it couldn’t be that bad, right? Probably just a dead battery! Oof. HitchBot was designed to be a good travel buddy. It could make (limited) conversation and share local trivia, plus it had an onboard camera that took a photo every 20 minutes to capture precious road trip memories. Why would anyone destroy such a delightful companion? Humans may find robots creepy at times, but at the International Conference on Human-Robot Interaction in March, Japanese researchers presented a paper titled “Why Do Children Abuse Robots?” about scenarios where the tables are turned. The field study noted incidents of children hitting, kicking, punching, detaining, and physically manipulating a human-sized humanoid social robot at a mall in Japan. The robot encountered many children, and the researchers did follow up interviews with 28 of them. They wrote, “We found that the majority of [the children] did not regard the robot as just a machine, but a human-like entity … yet [they] engaged in the abuse, mentioning the reason as curiosity or enjoyment.” The researchers hypothesized that the children may not have felt empathy for the robots, even when they thought the robots were “upset” by being abused. Maybe it’s just bad luck that HitchBot had its first-ever vandalism problem in the City of Brotherly Love, but let’s not forget that it was Eagles fans who booed a Santa Claus and threw snowballs at him while “Here Comes Santa Claus” played at a halftime in December 1968. Maybe some things never change.